The number of multimeters on the market is constantly growing. However, as the offer grows, the quality of production significantly drops. It’s hard to find a decent unit with a set of useful features for an affordable price. They are either expensive or of poor quality. If you’re looking for a decent meter, go ahead and read our reviews. We offer a better insight into the capabilities of various units so that you can easily find the perfectly suitable one for yourself. It doesn’t matter whether you’re a professional electrician or a beginner; we offer honest and comprehensive reviews to narrow down your choice options. If you don’t like this particular product, feel free to check the other ones in our list, you’ll certainly find something of interest. The Fluke 77-IV is a new edition in the Fluke 70 series, and it offers a lot of useful features and options. You can test and measure capacitance, voltage, resistance, frequency, and more. 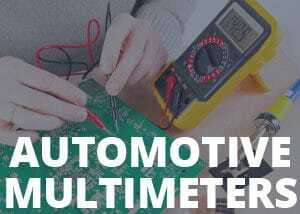 The best thing about this particular multimeter is that it can be used for various troubleshooting tasks outside the automotive industry, even if it’s labeled as an automotive multimeter. Like all instruments made by Fluke, this one has a great ergonomic design, a big digital screen, auto and manual ranging options, and most importantly – durability. These models are designed to serve their purpose for years, and that’s what makes products made by Fluke special. Many other multimeters on the market tend to stop working after a few years of service. However, you can rest assured that Fluke 77-IV will last up to a decade as long as you follow the user manual and take care of the unit properly. The capacitance and resistance ranges are large enough to serve most of the purposes of a professional, which is a great thing considering its affordable price. This unit has a large 6000-count crystal-clear screen which can be easily read even in unfavorable dark conditions. It also works great under peculiar angles, which is pretty important. A lot of mass-produced multimeters have a screen that can’t be read under certain angles because the symbols lose contrast. However, this one doesn’t have the same issue, and that’s what makes this feature worth mentioning. Although it might seem pretty irrelevant, it’s quite important to highlight this beneficial capability because not many DMMs have it. Most of the units on the market have an auto-ranging feature, but that doesn’t mean it shouldn’t be mentioned. In fact, beginners benefit greatly from this feature because they don’t need to set the scale manually and risk potential damage. Instead, you can simply let the device do it for you. However, if you do want to set the mode manually, you can do that as well. It may take a bit more time to set up the unit manually in oppose to automatic mode, but you’ll get authentic and accurate data. If your device is set on auto ranging, you’ll see a symbol appear on the screen and notify you about the active mode. If you’re not sure how to set up the device, feel free to use the automatic mode, you can’t go wrong. Another useful feature of the Fluke 77-IV is the data hold option. It allows you to store your last reading if you aren’t in a situation to write it down or remember it. The function works on a pretty simple principle. Even though the device doesn’t have internal memory and it can only store one last reading, it still helps a lot in tight situations. It also saves a lot of time and effort. If you want to use this feature, simply hold the “hold” button for a few seconds while conducting an analysis and it will get stored until you overwrite it with new measurements. The design is what makes this multimeter special. It’s very well-made, lightweight, and can fit any pocket. This fact is especially important for professionals who often work outdoors. Its portability is one of the main features it has to offer. It may not sound impressive and important, but it’s worth mentioning because some people specifically look for this feature. The compactness of the Fluke 77-IV allows you to put it in any toolbox and take it with you wherever you go without it being a burden. You can also buy an optional magnetic hanger which can help you to put the unit away and stick it to a metal surface so that you always know where it is. Who Can Use This Unit? As we said, one of the best things about this particular multimeter is that it can be used both by DIY enthusiasts and professional electricians. The beginners love its auto-ranging function and the general ease of use. On the other hand, the professionals like its ranging capabilities, precision, and accuracy. Also, due to its lightweight and small dimensions, it can serve as a perfect accessory for field work. The thing that makes this multimeter different from the others is the fact that it’s great multimeter for a car, but it works fine for other purposes as well. So, besides the ability to check the battery in your car, you can also conduct various measurements around your household. If you’re looking for a precise and accurate instrument, the Fluke 77-IV might be the one. There aren’t many things we didn’t like about this particular product. It’s quite versatile, and it offers a ton of auxiliary features which work as advertised. However, there are some shortcomings that need to be mentioned. First of all, the main problem with all products from Fluke is the rotary switch. After years of use, the rotary switch becomes a weak point. However, this shouldn’t be a concerning issue because it takes a lot of time for the rotary switch to get annoying or unresponsive. The elephant in the room is the lack of the True RMS feature. While it has a somewhat premium price, the Fluke 77-IV doesn’t have a True RMS feature, and it bothers a lot of people. On the other hand, it doesn’t mean that it isn’t accurate and precise. There are other technologies and accuracy mechanisms integrated into the unit to compensate for the lack of True RMS. Some users reported that they got the Fluke 77-IV shipped without the test leads. While it’s not a performance issue, it’s worth pointing out. If you happen to be in the same situation, return the product, and you’ll get a new one shipped pretty soon. Can I measure temperature with this unit? This particular multimeter doesn’t have an option to measure temperature. Not at all. It’s quite straightforward and user-friendly. As long as you know what are you doing, you should have no issues with the Fluke 77-IV. Do I get a calibration certificate with it? You won’t get the certificate by default, but you can order one for an additional fee. However, if you don’t need the certificate for specific reasons, you can always check the precision of a product by hooking it to a known voltage source (e.g. power socket). What is included with the meter? If you opt for this product, you’ll get a pair of test leads, battery, meter, and the protective case. What are the ranges on this unit? It has four ranges. Two for the mA input and two for 10A input. The mA ranges are from 0.01mA to 60mA and 01mA to 400mA. The 10A ranges are from .001A to 6A and from 0.01A up to 10A. People seem pleased with this particular multimeter. Its versatility and ease of use are what makes it worth checking out. It’s suitable for various troubleshooting tasks and field work as well due to its compactness. The users from Amazon left mostly positive reviews, and the unit has a 4.4-star rating, which is impressive. Individuals who bought this product pointed some disadvantages out, but all of them are solvable and minor. If you’re looking for a top-quality multimeter with an admirable set of features, this might be the one. It has everything you’ll ever need for conducting various measurements and analysis. It’s compact, well-made, and most importantly – affordable. Although it doesn’t have the True RMS feature, it’s not noticeable because other technologies compensate for the lack of the True RMS. If you didn’t find this particular multimeter interesting, feel free to check out our other reviews, and you’ll find a meter that’s worth purchasing.